Caring for a terminally ill loved one is uncharted territory for many of us—an emotionally fraught journey into the unknown, with fear, guilt, grief, and resentment as unwelcome traveling companions. 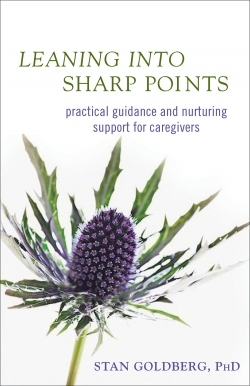 In Leaning Into Sharp Points, Stan Goldberg, a retired professor of communicative disorders and a therapist in private practice, skillfully navigates caregivers through this terrifying terrain by preparing them for what’s around the next bend, providing them with practical advice, and validating the many emotions they are likely to experience along the way. Goldberg stresses the importance of cultivating compassion, respect, and understanding for both the loved one and the caregiver. His practical advice ranges from tips on communicating effectively about end-of-life issues to solving common challenges. Goldberg also helps readers grasp the emotional and physical experiences of the dying individual, and he cites personal examples throughout. Useful appendices list support groups and medical resources and include sample legal forms. Goldberg encourages readers to employ the insights of a Buddhist teaching on confronting difficulty: lean into the sharp points. The sharp points are the many obstacles we face in life, and caring for a dying loved one is a veritable thicket of painful barbs. By facing the experience with an open mind and an open heart, caregivers are better able to ease into the unavoidable pain and, as a consequence, reduce their own suffering. Goldberg shines when he focuses on the power of communication to overcome many of the difficulties between the caregiver and the dying loved one. A bedside hospice volunteer, Dr. Goldberg was named Volunteer of the Year in 2009 by the Hospice Volunteer Association, and his book Lessons for the Living received the London Book Festival’s Grand Prize for Best New International Book of 2009. When it comes to caring for terminally ill patients, Dr. Goldberg reminds readers that “Caregiving is not about magnificent gestures. It’s about doing small, routine, and often time-consuming things, actions that say to your loved one: ‘I’m here for you.’” Recommended for anyone working or living with those suffering from a terminal illness, especially if the patient is a loved one.